The end of the special edition of Return of the Jedi sees many planets in the Star Wars galaxy celebrating the fall of the Empire. 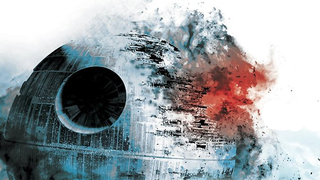 But Aftermath, a new novel by Chuck Wendig, is going to show us what happened next according to Disney’s new canon—and it’s not the happy ending we thought it was. Aftermath is one of the first post-Return of the Jedi, pre-Force Awakens tie-ins that are part of Disney’s new “Journey to The Force Awakens” plan to flesh out the 30 years between Episodes VI and VII in their new canon. While we’ve had a few hints and teases about the book—including the fact that it establishes the old-Expanded Universe idea of the New Republic being set up in the wake of the Emperor’s death—but Entertainment Weekly have now released an extensive excerpt from the novel’s opening that tells us pretty much what happened immediately after those celebrating crowds on Coruscant brought down the statue of the Emperor at the end of Jedi. The sound like a giant bone breaking. A fracture appears at the base of the statue. Applause as it comes crashing down. The head of the statue snaps off, goes rolling and crashing into a fountain. Dark water splashes. The crowd laughs. And then: The whooping of klaxons. Red lights strobe. Three airspeeders swoop down from the traffic lanes above—Imperial police. Red-and- black helmets. The glow of their lights reflected back in their helmets. There comes no warning. No demand to stand down. The laser cannons at the fore of each airspeeder open fire. Red bolts sear the air. The crowd is cut apart. Bodies dropped and stitched with fire. But still, those gathered are not cowed. They are no longer a crowd. Now they are a mob. They start picking up hunks of the Palpatine statue and lobbing them up at the airspeeders. One of the speeders swings to the side to avoid an incoming chunk of stone—and it bumps another speeder, interrupting its fire. Coruscanti citizens climb up the stone spire behind both speeders—a spire on which are written the Imperial values of order, control, and the rule of law—and begin jumping onto the police cruisers. One helmeted cop is flung from his vehicle. The other crawls out onto the hood of his speeder, opening fire with a pair of blasters—just as a hunk of stone cracks him in the helmet, knocking him to the ground. The other two airspeeders lift higher and keep firing. There’s much more at the link below, but basically Return of the Jedi’s happy ending now manages to stay happy for... like, about five seconds maybe? Which is kind of a bummer, but I guess we need a reason for the Rebels and the Empire to shed their names and go at it again in The Force Awakens. Star Wars: Aftermath will be out on September 4th, which might as well be renamed as “Global Give All Your Money To Disney Day” at this point.